Koper is a city of about 25,000, located in the Slovenian province of Istria, at the northern end of Slovenia's brief 29-mile stretch of coastline. Originally an island just off the coast, Koper is Slovenia's oldest town, dating back to the Middle Bronze Age. 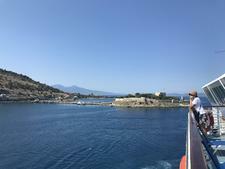 In Greek times, it was known as Aegida; the Romans called it Capris, and it was later named Insula Capraria (Goat Island) in the sixth century. The Byzantine era followed, along with a new name -- Justinopolis. Then came the Venetians, who ruled it the longest (1279 to 1797), calling it Capodistria, which eventually morphed into the Slovenian "Koper." The town changed hands briefly several more times and was part of Yugoslavia before Slovenia became an independent country. With its Venetian history and proximity to Italy, you'll notice that Koper has a bit of an Italian feel to it -- and, in fact, Italian is the second language here. What was once the fortified island is now Old Town, and part of the surrounding water has been filled in to connect it to the mainland. A ring road surrounds Old Town, marking a sharp distinction between its historic architecture and the less-attractive modern buildings outside of Old Town. Guidebooks don't sing Koper's praises, but the town has its charms, with enough to keep you occupied during a relaxed day on shore. One of the nicest aspects is Koper's lack of tacky shops and mobs of tourists. You can stroll from the port to Old Town's ancient main square, take in the sights, do a bit of shopping, relax with a coffee under a 15th-century loggia, check out the farmers market, sample Istrian wines or soak up the seaside Adriatic sun at an outdoor cafe. As Slovenia's only cruise port, Koper is growing in popularity. In 2016, 70 ships called here, as opposed to just 49 in 2015. Visit soon, while the town still retains its mellow, untouristy atmosphere. 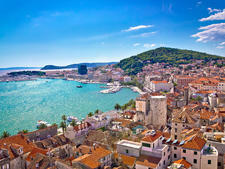 You're docked right next to Koper's Old Town, within walking distance of shopping and all the town's sights. There are no facilities at the port, aside from security clearance, a large map and a few souvenir sellers who set up when a ship is in town. To reach Old Town from the port, you'll need to climb about 50 steps or take an elevator (which wasn't working when we visited) that's directly across from the port. To reach the main square, Titov Trg (about a five-minute walk), take a left once you've arrived up top and then take your first right onto Verdijeva Ulica. It will lead you past Venetian-era buildings into the square, where you'll find the cathedral, the Praetorian Palace, a grocery store, a cafe under a lovely loggia and the tourist office. Keep walking straight across the square to reach Koper's main shopping street, which also has cafes scattered among the shops. If you're in port on a Saturday, be aware that many businesses -- including most shops -- close at 1 p.m. Museums and restaurants are an exception. Most shops are also closed on Sunday. If you're making a large purchase, we found that bargaining was possible at some, but not all, shops. Give it a try, but don't bargain on smaller items. On Foot: Most of Koper's tourist attractions are within a 20-minute walk of the port. Once you're at the town level, the area is fairly flat, with a slight down-slope as you walk further into Old Town. By Local Bus: Line #7 does a loop around Old Town. You can pay less by purchasing your ticket from a vending machine, or pay a higher price directly to the bus driver. By Taxi: Taxis are plentiful at the port and metered. You can also book fixed-rate taxi transfers online between Koper and Ljubljana (61 miles or just over an hour travel time). By Train: The train station is located about half a mile southeast of the port. Here, you can catch a train to Ljubljana, with a travel time of about 2.25 hours. By Bus: You can travel by intercity bus to Ljubljana (61 miles or about 2.25 hours) or the coastal town of Piran (12 miles or about 35 minutes). Buses leave from the train station, and you might also find van-taxi drivers outside the station who are eager to offer you the same fare for what is usually a faster trip. Slovenia's currency is the euro. 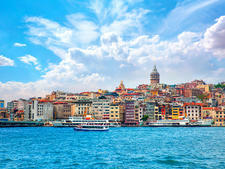 For current currency conversion figures visit www.oanda.com or www.xe.com. You'll find ATMs around town. The most convenient one is located on Kidriceva Ulica, the street that will be on your right as you enter Tito Square in Old Town on the way from the port. There's also an ATM at the Mercator grocery store on the square. 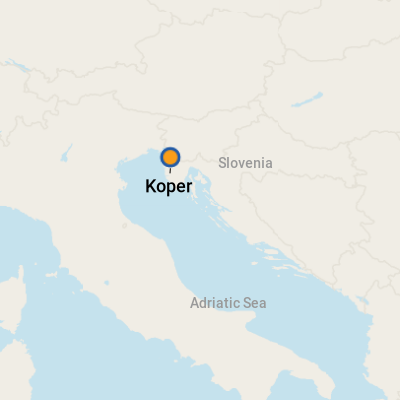 Koper is only 3 miles from the Italian border and is officially bilingual, in Italian and Slovene. You will also find English spoken in many shops, attractions and restaurants -- perhaps not fluently, but enough to communicate. Shopkeepers may show you an item's price using a calculator if their English is limited. If you've spent time in Italy, many dishes you'll encounter in Koper may seem similar -- minestrone soup, for example. But because Slovenia changed hands so much through the ages, you'll also find other influences, like Hungarian goulash or Ottoman kebabs and burek, round, flaky pastries with savory fillings. Fish and seafood are popular, as is the use of local olive oil and pumpkin seed oil. Pastas and risotto make an appearance, too. But there are also hearty traditional dishes: stews, grilled meats and sausages that might make cruise food seem light by comparison. Traditional vegetarian dishes include struklji (dumplings) with vegetable fillings and zganci, which is like a fine-grained polenta but made from corn, wheat or buckwheat. You'll also find potatoes served with many main courses. The national dessert is prekmurje gibanica, an eight-layered cake with poppy seeds, walnuts, apples, raisins and ricotta fillings. You might also encounter smorn, a large, thick pancake that's chopped up while still in the skillet and served with fruit sauce; it's a popular street food. Wash your meal down with local wines, including whites, Rebula and Malvasia (Malvazija), or reds, Refosco (Refosk) and Teran. Slovenia has more than 28,000 wineries and at least 52 varieties of vines -- so you're sure to find something to your taste!